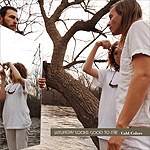 All Music Review of "Cold Colors"
This guy RAINBOWTRASH reviews "Green Mansions" and also put up a vinyl rip of it on mp3 for you to hear. Here's a few songs we recorded at SXSW 2007 for mp3.com. They also have some sort of summary page set up, but the videos are the most important thing. Everyone looks so bored! 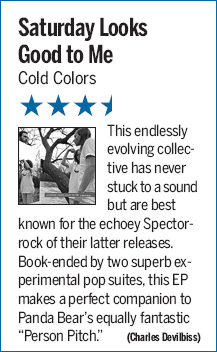 Pitchfork reviewed it as well! so did Indieworkshop.com... they reviewed all our records! It's kind of hard to tell if they liked them or not, but they did in fact review all of them. Pitchfork Review of 2004's "Every Night"
Pitchfork Review of 2003's "All Your Summer Songs"... which they liked enough to name one of the top 50 albums of the year! Visit the Saturday Looks Good To Me Gallery section.